The first obvious one would be going out to eat instead of eating something I’ve (okay my husband) prepared. I grew up in a family where we went out to eat constantly, particularly as I got older. It became so commonplace for our family to meet up for dinner out because we still valued family time, but we were never all home at the same time with our crazy schedules. So we’d meet at Burger King, or Arby’s, or the local Mexican place. And yes, I grew up eating fast food in my small, dry (no alcohol could be served/sold) town where it was like fast food nation. So going out to eat became a part of my daily routine, it seemed normal to eat those meals on a regular basis. And I guess my some miraculous stroke of luck, I was active enough in highschool that I wasn’t humongous as a result. While I’m thankful that this lifestyle didn’t take me to morbid obesity, it did firmly plant the desire in my head to go out to eat as a normal part of my life. That has been probably the #1 hardest adjustment to trying to live a healthier lifestyle. My husband and I try to limit how many times we eat out during the week and weekend by cooking in advance. It works most of the time, but if he even hints that he doesn’t want to cook, that inner fat kid inside of me is literally jumping up and down at the chance to go out to a restaurant and eat even though I know I’ll regret it later. So for me, it’s been a struggle to eat out less, but also to reign my inner fat kid in while I’m ordering and make a good decision. Because, let’s be honest – not going out to eat ever is not a reality in my life. Today, I had to grab something for lunch because we only prepared 4 lunches this week, and I have a meeting right after lunch so I wanted to just grab something on campus. I just went to the food court and went to each place and evaluated their menu and asked myself “WWSDD?” (really? you can’t guess? What Would Super Dre Do!). I passed on the Asian place – all the options were fried today. Boo. Hiss. Looked at the burger studio and considered the char grilled chicken sandwich but then the sides were either fried or unappealing. Pass. The pizza place was next, and while I could pretend like I don’t know how many calories it’s possible to pile into a vegetarian slice of pizza, I’m not going to. Pass. I don’t even bother to look at Popeye’s menu – i don’t think they have anything not fried. I come to the Mexican (think moe’s but not) place. Mexican is my favorite. I scan their menu. 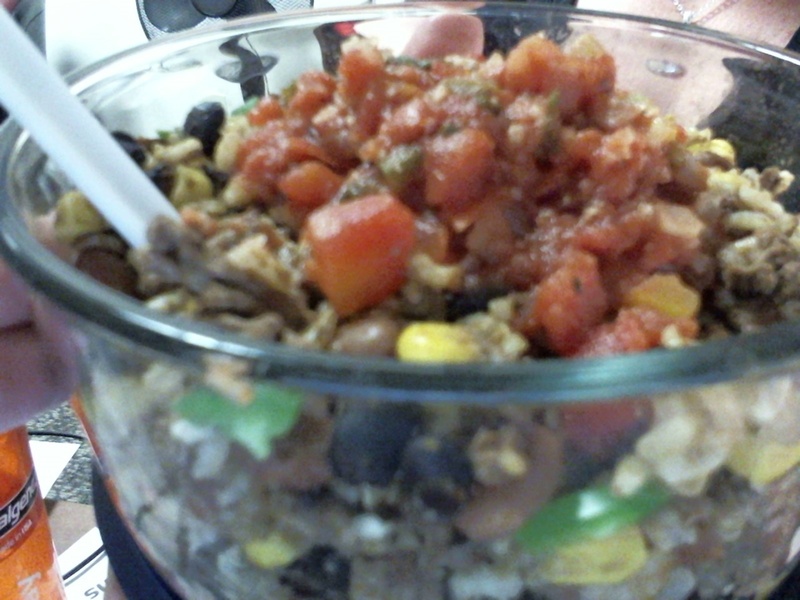 I can do a burrito bowl (no tortilla or shell or chips – check!). I’m not a fan of the meat options – it’s all roasted or pulled pork. Fail! But they do have grilled mushrooms and beans. Fabulous. I order a burrito bowl with lettuce, black beans, mushrooms, LIGHT ON THE CHEESE please and absolutely no queso (even though the inner fat kid is squealing at this point), and I load it up with veggies like black olives, pico de gallo, cilantro and jalapenos. I skipped the dressing and got tomatillo salsa instead. I’m eating it at this very moment and I have to be honest – this is good. It’s not the mile high nachos covered in queso that caught my eye, and it’s not the quesadilla loaded with cheese that was calling my name so very sweetly. But the healthy decision actually turned out to be quite good. And I bet my stomach won’t be hurting later from a poor life choice. I have to remember this moment next time I am about to order something just to shut the inner fat kid up. She needs to grow up anyway and realize that instant gratification is just that – only in that moment. I’m in this for the long haul, and the good decisions I make can be the best of both worlds – delicious, and easy on the conscience later. Stuck in the middle with….me. I said something to a friend this week, and after I said it I felt like it struck a chord as being at the heart of my weight loss struggle. And I have been reflecting on it since then and decided that maybe it was something others could relate to while they are on their own journey (whether it’s weight loss related or not!). *I will warn you that this post is not really going to answer the questions I pose today – just expand on what they mean to me. But it may give you something to think about, too. 1) What is too much structure? 2) What is too little structure? I find that I am much more effective with my weight loss when I have extreme structure – but that can only co-exist with my REAL life for so long. Eventually, I can’t sustain the high level of structure and everything crumbles to the ground. I would say that is pretty common for most people. That’s why we have a society of get rich quick schemes and lose weight in 10 day programs that really don’t work in the long term. I’m not looking for short term success. I don’t want to lose all the weight only to gain it back – that’s just not good enough for me. So what is too little structure for me? A few examples would be: when i don’t force myself to journal my meals and when I don’t have a work out scheduled. So even though I prefer to not plan every little detail out – it helps when I do. But when I let myself slide and I don’t record my meals and i don’t pre-plan my workouts – I just tend to do nothing productive at all and that is also not good enough for me. So where is the middle ground on this? How do I make healthy choices a NATURAL choice for myself and not something that feels like a rigid, structured program? I honestly don’t really want to have to write down everything I eat for the rest of my life – so does that mean I won’t ever meet my goal? Or do I just need to be journaling my food during the weight loss journey and know that it’s not a forever thing because I will use the journey to integrate healthier decisions into my meals? Perhaps I could deal with a more rigid structure of documenting everything if i knew it wasn’t going to be a forever thing. Is that an example of healthy balance and compromise? I also deal with the struggle between doing AWESOME during the work week and doing the OPPOSITE of awesome during the weekend. Anyone else have this problem? Talk about self-sabotage. What good is working out 4 times a week and eating healthy meals and snacks if on the weekend I act like i don’t care. But in reality – i DO care. Desperately. It’s like someone takes over my body on the weekends and then I’m left with the unfortunate results come Monday morning. I’m struggling to find the balance between the two versions of myself when it comes to losing weight. Dre works a typical 8-5 type of job. She brings a healthy breakfast every morning, takes her multivitamin along with drinking her first 32oz nalgene bottle of water before lunch time. She typically has no more than 1 coffee with fat free or sugar free creamer in it. During the day, she continues to refill her water bottle at least 2 times. For a mid morning snack, dre might have a Shakeology shake to get in some extra protein, healthy dairy or a granola bar. For lunch, she always brings her lunch with her to work as her and her husband prepare healthy meals selected from cooking magazines such as Cooking Light or Eating Well. She drinks water with her lunch. In the afternoon, she may have another small snack as directed by her nutritionist to keep the metabolism firing. This would consist of something like carrots and hummus, reduced fat triscuits or string cheese or a combination of these things. Dre also tries to drink 8oz of 100% fruit juice during the day since she doesn’t eat fruit. Sometimes this is a chore, but she does it anyway. After a day in the office, Dre goes to the gym to work out for an hour. She participates in group exercise classes such as TurboKick, Circuit workouts and even teaches one of these classes once per week. After working out, Dre goes home to throw the frisbee with her puppies and her and her husband sit down to eat dinner together. Again – this is a pre-selected meal from one of the healthy magazines that represents a variety of food groups. She usually drinks water with her meal. For the occasional nites where a snack might occur before bed – homemade popcorn with I can’t believe it’s not butter spray is used, or maybe a skinny cow ice cream sandwich. Repeat. Ok, so this was halloween. But still - you get the point. I go all-out. Sleep in until 10am or so on Saturday – play with the pups and make breakfast for myself. This is scattered and sometimes it’s a granola bar, or eggs. Nothing big. Clean the house, pay some bills, meet with the dog trainer. Usually I will eat a left over lunch from our week of meals. Sometimes there is no food in the house so I will have to make an effort to leave the house to go get something. I try to be good here and do a grilled chicken sandwich or something (no fries). I might treat myself to a diet soda. Fast forward to evening – going out to eat with friends, probably some wine and beer. Apps are ordered, I find myself indulging. Sunday morning: wake up feeling groggy so hubby and I go get breakfast at a local spot. Go grocery shopping, play with the pups, house project….probably some wine or beer drinking happening while at the house. Dinner is sometimes out, sometimes with friends. Not controlled. As i’m writing out typical behaviors on the week day vs the weekend – it’s easy to see some crucial differences (I thought it would be funny but actually it turned out to be helpful to do this instead of funny because my life really isn’t that interesting). Mainly – having wine and/or beer and eating out more than once. Being in a situation where I’m not on a schedule allows me to make some bad choices I wouldn’t normally make. So where is the balance between too much of a scheduled weekend, and not enough? I guess there aren’t real answers here – only more questions. But it all comes back to finding the balance between too much structure and too little. Maybe if i can figure out where that is – I’ll be able to start moving forward. Just feeling a little caught in the middle at the moment. You know? So many of us fall into a rut of eating out during the work week. But why eat out when you can make delicious lunch meals that are healthy and easy to make over the weekend? Today, I’m having a Tex Mex Rice Bowl – and this was seriously simple even for a no frills cook like myself. We got the recipe from our fav cooking magazine: Cooking Light. If you are interested in the recipe, you can check it out here. We changed up a few things because we are cool like that…. Basically – we doubled everything except the rice because we tend to eat our biggest meal of the day at lunch so we can power through our evening workouts. So if you want to double it up, we just got 1lb of ground sirloin, a full can of corn, 1 can of black beans, 1 can of pinto beans, and we used an entire pack of our favorite taco seasoning and kept the rice to the recipe suggestion. Top it off with jalapenos and salsa – yum! This literally took us about 15 minutes to make yesterday. Just cook the sirloin while you are making the instant rice and then you basically dump all the other ingredients in there and warm it up. So now we have enough for 4 meals – we both will eat this lunch twice this week as per our usual plan! You can cook ahead of time and warm in the microwave at work in just a few minutes. Bring the salsa on the side so it’s nice a fresh. You’ll have others in the office asking you what you brought for lunch when you make this – because it smells amazing! And if you aren’t a sirloin kind of person, you can EASILY switch the meat out for turkey, chicken, pork or tofu. Such a simple recipe – enjoy! A long time ago, I fell in love with the band Dashboard Confessional. Sometimes, when I’m really frustrated with what is on the radio while I’m driving the half an hour+ commute from or to work, I’ll pull out those old beloved EP’s and sing at the top of my lungs to some of my favorites. Remember to Breathe is one of them. Another would be Hands Down. At my wedding, I actually was escorted down the aisle by my father to the Vitamin String Quarter version of Hands Down (see below): . I notice that a lot of the songs I used to be in love with don’t really apply to me anymore. But I still sing with them at maximum vocal power, and I remember all those emotions that used to sweep over me when the songs really did represent something that was actually happening to me at that time in my life. Sometimes it feels like songs are more like memories. My childhood best friend and I have a strong connection via music and lyrics. Fairly often, I’ll receive a text message from her in the middle of the day or night with just a lyric from one of the many songs we used to listen to over and over again during high school. And the memories flood back to me of those moments that are now….a long time ago. I was getting ready for a neighborhood party this weekend and had my Pandora on playing in the house and the beginning chords of a song that overpowers me every time I hear it started and I just had to stop what i was doing, and listen (Alien by BUSH if you must know). And again – I’m transported back to a specific time in my life and I can’t help but have those old feelings wash over me again even though absolutely none of the things that I feel when I listen to the song relates to my life now.But that doesn’t mean that you don’t remember how it felt. Yesterday, I was having a conversation over what I’ll call an unusual “happy hour” gathering by our office – and someone said they were having a hard time relating to someone who was trying to heal from a broken heart. For me, I find it impossible to forget what it feels like to have a broken heart. Even though I’m in an awesome relationship and happy – I just don’t think those feelings will ever truly fade from my memory. Maybe that isn’t the same for everyone. Or maybe I’ll feel differently when it’s been several decades ago. But man, I still remember how much my heart hurt after ruined and failed relationships in my past. That doesn’t mean I’m interested in re-visiting any of those relationships by any means, but I just feel like I will never forget even if i try. And even if i did manage to forget for awhile, I would eventually hear a song that brought it back to me crystal clear. For me, it’s just the way I store memories – they are associated with a song. In general, I think I have a hard time forgetting past emotions and really, that’s a big part of my struggle with trying to be a better, healthier person. It can be difficult to let go of how I’ve failed in the past, and I clearly remember the disappointment of trying and not succeeding. But I’m trying to turn it around and look at the upside. That as much as I might remember a time when I didn’t do something right or feel 100% about things – I can also have clear memories of me succeeding, achieving my goals and I need to fuel the down in the dumps days with the memories of a day well done. So my homework is to find a song that signifies success and inspiration so that i can blast it in my car on the down days to remind me that tomorrow is a new day with so many opportunities to succeed. What do you do to keep yourself motivated when times are tough? 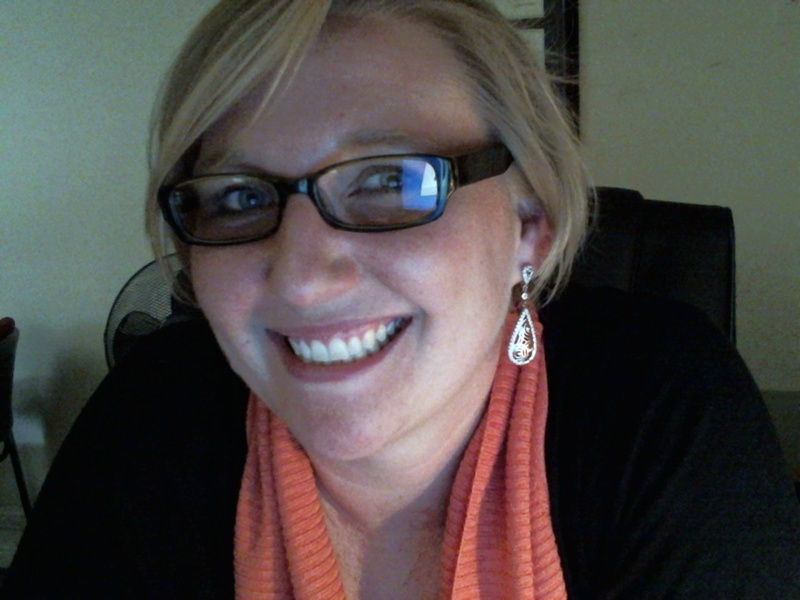 I’ve Changed By Not Changing at all…. *Points for the first person to name the band my blog title today salutes. Today is Friday, otherwise known as Weigh In Day. In other languages this would interpret to things like “Soul Crusher” “Iron Fist” and things of that nature. It’s a love hate relationship with my scale on Friday mornings. In light of my post earlier this week about having a back up plan when the scale doesn’t give you good news – I’m practicing my own advice today. I think this is a fantastic idea - decorate your scale! After a week of work outs and eating on plan, I just stayed the exact same this week. So it’s good news because I didn’t gain weight – but frustrating because I felt like I did everything right this week. I pulled out the old measuring tape and decided to log my measurements today so I can use this as a form of success in the future. Then I went to find a pair of jeans to wear and decided to pull out a pair I bought several years ago on a visit back to Kentucky. They would be an example of “test jeans” that I put on to evaluate my progress with weight loss. Well, they fit – buttoned, zipped up – the whole 9 yards. That means I’m counting this week as a success. I’ve had a full week of making good decisions, working out hard – i even hit 3300 calories burned TWICE this week for my daily total. I sometimes wish (okay all the time) that my scale was MORE like the the sorting hat from Hogwarts. That it would somehow look deep inside my soul and give me some honest feedback instead of just a number. I think this week that process would have reflected a weight loss based on my genuine efforts. Sometimes not changing – just staying the same, is necessary I suppose, even if I don’t really like it. But when our typical form of measurement doesn’t show us what we want, we look more deeply at ourselves, our decisions, and other ways to find success for ourselves. This is across the board – not just for people trying to lose weight. It serves as a learning process, and despite the fact I’ve struggled with weight my whole life, I always learn something about myself when I get serious about losing it. I’ve learned along this process that we don’t always get the number we want. Losing weight isn’t an overnight process and you have to KEEP working at it to see long term results. Having a short term focus isn’t enough when you are trying to be healthier. You have to commit to the big picture and remind yourself why you are doing what you are doing every single day so you can try and stay on track. I have also learned that I am a lot stronger of a person than I imagined, and resilient. I think these are important qualities to have and I’m proud to have discovered them in myself. And even though this process I’m going through is taking me a lot longer than what I’d like – experiencing the journey will make the destination that much sweeter. What’s your Back Up Plan? You know, for when plan a doesn’t go as you wanted, or plan b wasn’t as good of an idea as you thought it would be? We spend a lot of time making goals and saying to ourselves, no need for a back up plan because I GOT this! Right? But how many times have my plans failed? Um, a lot.